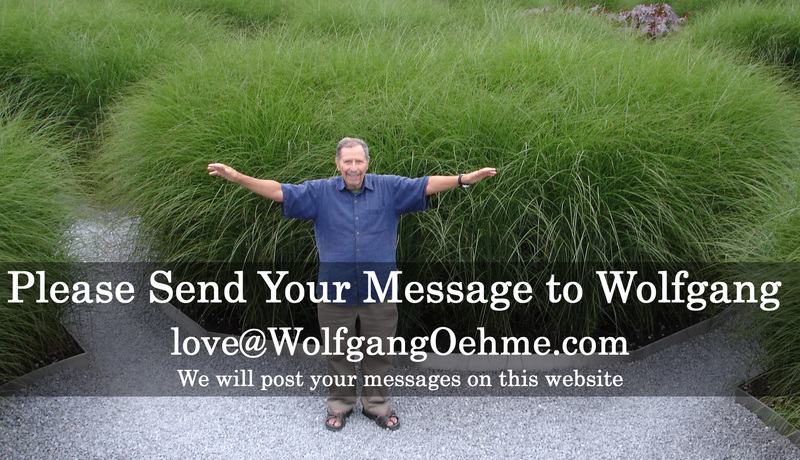 Please click to send your message to Wolfgang. 65 Anne Dowell Wolfgang had a lifelong passion for plants that was infectious. I never look at billowing ornamental grasses without thinking of him, and that reminds me of a poem by Christina Rossetti: "Who has seen the wind? Neither I nor you: But when the leaves hang trembling, The wind is passing through. Who has seen the wind? Neither you nor I: But when the trees bow down their heads, The wind is passing by." Think of Wolfgang in that wind and he never will be far away. 64 Mark Wilson Mr. Oehme, you and Mr. van Sweden changed what I thought was a "garden". You opened my eyes and mind to a larger world beyond English borders to a garden filled with flowers and grasses. My beloved profession, landscape architecture, is deeply in your debt. Rest in peace. Wolfgang was full of such joy and passion for his work that it is hard to view what he did as work. His zeal to experiment with new plants, to learn from his gardens every day and to share what he learned as widely as possible has been a tremendous inspiration to me as a new landscape architect at OvS. At eighty years old, we could still count on Wolfgang to know the best new plants to try, which formerly-promising plants were not worth planting, and which old reliables could still be relied upon. On his garden tours, Wolfgang displayed not only his tremendous knowledge, experience, and the fun that he took in his planting design but also his famous energy, leading groups for hours without tiring while everyone around him was flagging. The mischievous side to his personality would be on display when he pointed out the test plants that he had sprinkled in clients' gardens, often smuggled in as tiny things in his pocket and planted without their knowledge. He was a true plantsman in the way he used every opportunity to experiment, learn, and improve. It seemed that Wolfgang's energy and enthusiasm for his life's work would keep him in the garden forever, and it is hard to believe that such an indefatigable person is gone. I am grateful to have learned from such a master. More importantly, I am grateful to have known Wolfgang's generous and joyous spirit. He will be missed. Thanks to Wolfgang for his inspiring, chunky plant combinations. 60 Carole Oottesen Dec20/2011 Wolfgang will be greatly missed. 58 Keia Butts Dec20/2011 WhAT a great person!What a great designer!What an inspiration!What a legacy!I fell in love with Mr Oehme's work while studying Landscape Architecture at Morgan State University. It was during this time that I also had the pleasure to meet with Mr. Oehme and interview him on the Towson Courthouse Garden and other projects. It was a day I'll never forget. I salute you. You will be missed but your legacy lives on. Thank you for inspiring me and others. Wolfgang, I knew I was in for a treat years ago when I parked in a friend's driveway next to a car with ornamental grasses billowing from the trunk. Somehow I knew it was you before we were introduced. Later tours of gardens with you and Roland were always an inspiration. I'm glad my son also met you and you showed him your garden, and we treasure our autographed books. We had many great conversations, not only about plants but also about construction, building materials, and energy efficiency; and politics--both in the United States and your witness to changes in pre-war Europe. You will be missed. To Roland and family, my condolences. Dec20/2011 We have lost a great plantsman and a lovely generous man. My condolences to Carol and Wolgang's family. Schacht Dec20/2011 Lieber Wolfgang, gerade hatte ich eine Weihnachtskarte an Sie geschrieben und wollte mich nur noch einmal wegen der Adresse vergewissern... Es tut mir so leid. Nur wenige Menschen hinterlassen einen solchen - vor allem solch schoenen - Eindruck im Leben so vieler Menschen wie Sie. Ich bin gluecklich, Sie kennengelernt zu haben. I was saddened to hear of Wolfgang's passing. It was a real pleasure to meet with him and share his passion of plants, design and mother nature. We are all blessed with what he has shared with us all. Our thoughts reach out to his family.